Intelligent Content: What Does ‘Semantically Categorized’ Mean? Intelligent content is content that’s structurally rich and semantically categorized and therefore automatically discoverable, reusable, reconfigurable and adaptable. This article focuses on the definition’s second element: semantic categorization. Semantic means “related to meaning.” Consider, for example, a conference website. For each presenter, we need the same pieces of content: photo, name, business title, bio, session title, and so on. Metadata tags like <photo> and <name> would convey meaning about those pieces of content. These tags – unlike <H1> or <p> or other HTML tags – tell nothing about how the content looks. Instead, <photo> and <name> tell what the content is about, what the content means. That’s why we call this kind of tag semantic. Nothing against H1 tags, but they don’t give anyone (or any machine) a clue about the content’s meaning. H1 tags are not semantic. They can help machines figure out how to display content (like “make it big, bold, and blue”), but they can’t help machines do anything intelligent with that content (like instantly show people the names and photos of all the speakers at a conference). That’s where semantic tags come in. Okay, you get semantic tags vs. nonsemantic tags. You might wonder why content strategists talk in terms of semantic categories. I think of categories as buckets. Take our website example. Imagine a bucket filled with the names of all the speakers. If you want to create a list of speakers, and if those speakers’ names have been tagged as such, you don’t have to go hunting through all the content to pick out the names. You simply touch the bucket’s handle (its semantic tag) et voilà : All the names – and only the names – appear. A semantic tag gives you (and machines) a way to create a grouping. A bucket. Here’s one cool thing about semantic categories: They’re better than buckets. A piece of content can hang out in several buckets at once. 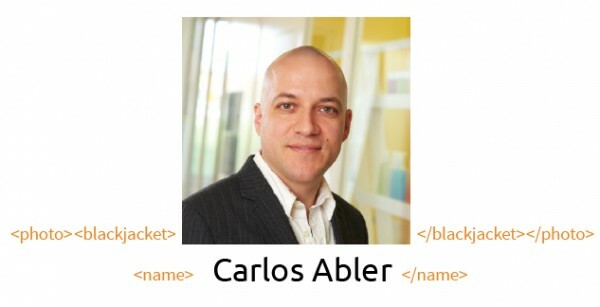 You might find Carlos Abler’s photo, for example, in the “photo” bucket and in the “blackjacket” bucket simultaneously. In other words, Carlos’ photo, like any piece of content, can belong to any number of semantic categories. By doing so, you give machines a chance to do intelligent things. This example shows two pieces of content: the speaker’s name and the speaker’s photo. The metadata tags shown in brackets – name, photo, and blackjacket – act as semantic categories. Like this photo, any piece of content can have multiple metadata tags. In other words, each piece of content can belong to any number of semantic categories. Semantic categories enable content managers to organize digital information in nearly limitless ways. The key is to choose categories that serve the company and the customer. For example, while the category “blackjacket” would serve no purpose on a conference website, it might help online shoppers find the perfect blazer. Semantic categories can be used with any kind of content in any kind of content management system. I can’t speak to all the possibilities. Since lots of us work with blogs, let’s go back to the blog example, as I promised in the beginning. Does your blogging software offer the option of creating “categories” or “tags”? Both those words (as used in many blogging platforms, anyhow, including WordPress) refer to semantic categories in the generic sense of metadata that serves to group content in meaningful ways. The terminology gets confusing, I know. If you’re not using categories or tags on your blog, consider exploring the possibility. I think you’ll find categorization helpful for your own purposes, and your audiences will benefit as well. As content strategist Rachel Lovinger pointed out in her recent Confab talk (borrowing from a meme which, in turn, borrows from a popular song), if you like your content, you should put metadata on it. 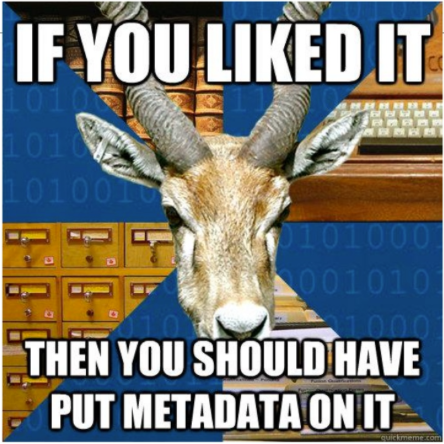 Content strategist Rachel Lovinger recently shared this meme with her Confab audience in her talk Metadata Is a Love Note to the Future. To get the most from your content, create meaningful metadata – semantic categories – and use those semantic categories in consistent ways across your team. Verify that your semantic categories support business goals and customer needs. 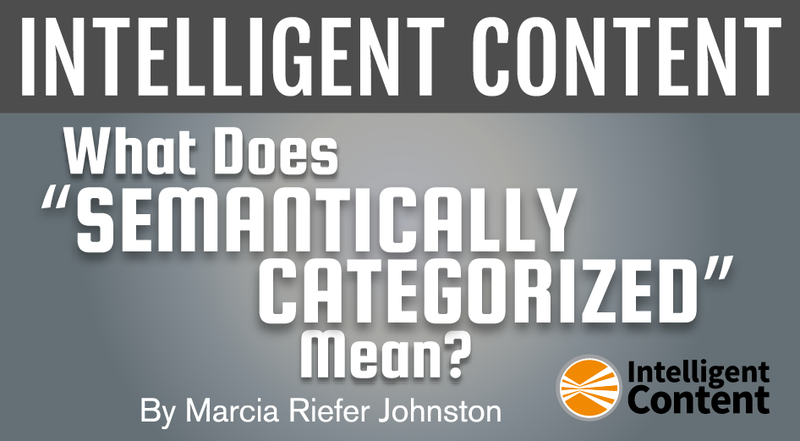 Semantic categories alone don’t make your content intelligent. But your content can’t become intelligent without them. How is your organization using semantic categories in its blog – or other content? Please tell us in a comment below. Love geeking out about intelligent content and content strategy? Sign up for our Content Strategy for Marketers weekly email newsletter, which features exclusive insights from CMI Chief Strategy Officer Robert Rose.